5 Stunning Road Trips To Take This Weekend! If your weekends are stuck in that same old rut—you know the one; coffee, shopping, laundry—we think it’s about time you hit that open road and added a bit of excitement into your weekend routine. It is time to take back control of your 48 hours of freedom, so buckle up and hit the road, people! Here are five of our favourite road trips in South East Queensland. Psst! Because we’re all about celebrating the many colours of South East Queensland, we’ve teamed up with Personalised Plates Queensland to not only bring you this article, but to take you to Miami! Click the banner below to score a trip to Miami now! We know, we know, the point of a road trip is to actually get out of town. But, we promise exploring your hometown can be oodles of fun. Kick things off with a morning sweat sesh at Kangaroo Point, followed by a caffeine hit at Jamie’s Espresso. Then, of course, shop ‘til you drop along beautiful James Street. For a dose of culture explore of Brisbane’s many galleries (we love TW Fine Art), or catch a show at QPAC. When the lunchtime hungries start to kick in, stop by one of Brisbane’s many laneways for a bite to eat,— Hello Please in Fish Lane is always on point. Then drive out to Manly to catch the sunset before calling it a night with a seriously luxe staycay at Spicers Balfour. Phew—what a day! Who said exploring Brisbane didn’t count as a road trip? 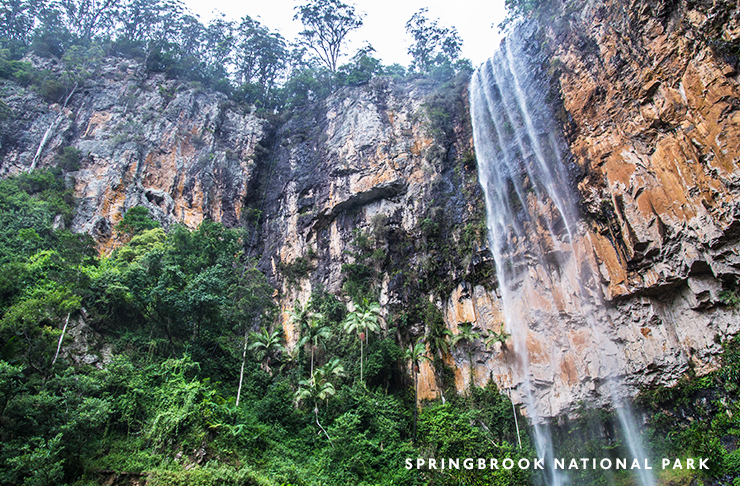 Springbrook National Park is home to waterfalls upon waterfalls, and a plethora of seriously breathtaking scenery. From lush green rainforest, to limestone cliffs, and then to the darkest of dark glow worm caves, there’s so much to see in our neck of the wood. The drive into the national park is beautiful, too; expect winding roads through Old Growth forests and views as far as the eye can see. Keep your phone charged for this one, because your Insta story will get quite the workout. Toowoomba is cool—trust us. No longer just ‘that place with the flower festival,’ Toowoomba is delivering the goods in spades. Aside from an epic line up of cafes, beautiful parks, and fresh air to give you a break from ‘city life,’ Toowoomba also has a thriving art scene. Check out their walking tours to see the city’s coolest street art. The Sunshine Coast Hinterland has a slew of hikes on offer for the more adventurous. We love Mt Coolum (wake up early and watch the sky explode with colour as the sun rises) or, if you’re really feeling up to it, try Mt Tibrogargan (warning: this is pretty much just rock climbing). The best part? They’re only 2 hours away! What would a road trip list be without a visit to the beach?! Pack the car up and head out for a day of coastal bliss at Noosa. Kick things off with breakfast exploring the ionic Eumundi Markets before heading into Noosaville. Pack your towel and walk through the Noosa National Park to discover hidden coves and crystal clear waters. Keep your eyes peeled for koalas! 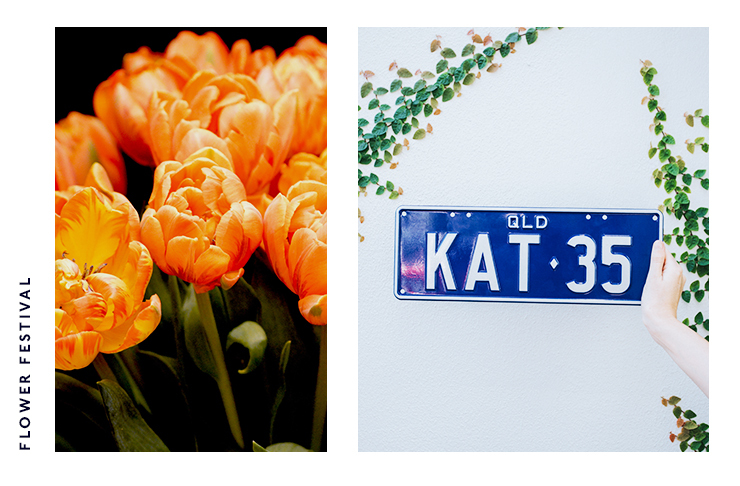 We’ve partnered with Personalised Plates Queensland and their vibrant Colour plates to celebrate our colourful metropolis, bringing you the most colourful dishes, locations, and sight-seeing spots across South East Queensland so you can find the inspiration you need to get your explore on around Brisbane! To see our editorial policy, click here.